“Some people rely on Facebook to tell them what’s going on in town, I am one those people. I have noticed there has been a significant decrease in FB invites coming my way. Summer is slow around here. A few straggled in, but I’ve haven’t seen much since Blockparty. 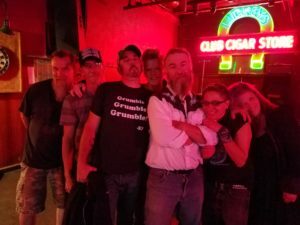 Last night I had a lull in my schedule and Katelynn posted on Facebook about a show at Luckey’s Club, Station Wag and Boomchick. I have never heard of the bands, I looked them up on the interwebs and both bands seemed to have a solid following. I made it to Luckey’s by soundcheck. I grabbed a beer, Ranier of course and waited for everything to come together. I liked this band from the very first riff. They have a great sound and well practiced. I felt there was room for more raw bass riffs. Still, a tight band. Towards the end of the set a guy takes the stage with the band and did a 90s rap-over-heavy guitar set. It was a tight freestyle kinda thing, it worked well. I was surprised that there wasn’t a big crowd for this band, especially for a band this good and on a Saturday night at Luckey’s. Station Wag closes the show. P.S. You can see what we’re up to every day on our Facebook page! Stay in tune and in touch! Hope to see you at a show soon! !